MakeUp Expert - You Are Beautiful! Do you find your nails breaking easily lately? Is it a brittle nail problem or do you think it’s something you can fix with a nail strengthener? One of the fastest and easiest ways to get long, healthy nails is with a top-notch nail strengthener. These provide nourishment to your nails and enhance natural growth. While there are many strengtheners on the market, it’s hard to know which one is going to do the job right and leave your nails with the perfect glow as well. This buyer’s guide goes through all of the different nail strengtheners available without formaldehyde. These are natural solutions meant to help your nails be their best, which means we don’t want any nasty chemicals ruining their potential! Your nails deserve to be pampered with the best solutions out there. The following were chosen based on their satisfaction rating, ease-of-use, and formaldehyde-free formula. We found a few other characteristics that we think you’ll love about each type, whether you want to go with a polish or cream-based solution. When you have brittle nails, you want an all-in-one solution that’s going to strengthen your nail but also add shine and work with your nail polish. 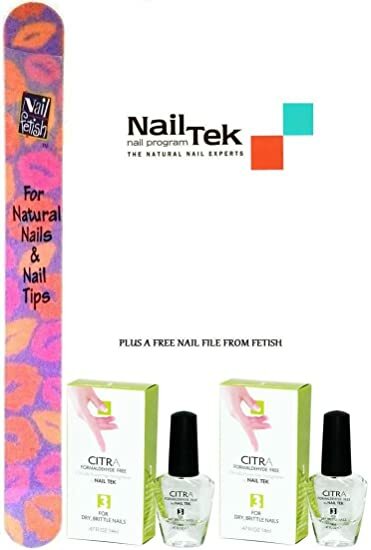 Nail Tek Citra 3 offers the perfect kit to heal your nails and strengthen them with naturally-occuring aldahyde compounds. This is a high-quality solution that works extremely well, even if you have difficult nails that take months to grow. After one week, you’ll see a difference in your nails’ length as well as their texture. You’ll notice how easy it is to apply your favorite polish and avoid breaking your nails on anything you touch. As a formaldehyde-free solution, you also don’t have to worry about the fumes or what the chemicals will do to your nails. With a natural solution, your nails will heal faster and retain their strength and shine for many weeks to come. You can apply Nail Tek Citra 3 to your nails once per week to keep up their strength. While we love Nail Tek’s solution, it’s a little bit costly compared to competitors. The included nail file is a great gift, but it doesn’t make the price right. We think that this is a professional nail strengthener that will work on anyone’s nails, however. If you have extremely weak, brittle nails, this could be just the right solution to toughen up your nails and start growing them longer. We love Morgan Taylor products because of their quality and long-term value. You’ll get a lot of use out of the formaldehyde-free strengthener and optical brightener. This purple solution is a maximum strength vial that you can use with your nail polish to keep your nails long and shiny. It works well to restore your nail’s natural color as well, while also improving brittle nails. If you want a strong, unbreakable finish, this is just the solution to go with. One of the great features of this product is the optical brightener that’s included with this solution. It’s the only one like at this price that will instantly make your nails look 10 times as bright and shiny as before. In addition, this is an extended wear formula, so you can expect it to last at least 14 days. 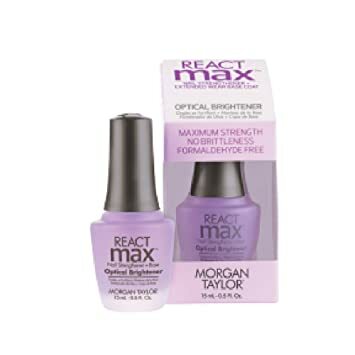 We like this nail strengthener from Morgan Taylor because it works perfectly to strengthen nails while also being fast-drying and instantly brightening. You can use along with your regular nail polish for better looking nails. If you don’t want to apply nail polish and want to create stronger nails naturally, you can use a cream solution. We tried the Barielle Nail Strengthener and found that this formula works extremely well, almost overnight, to improve the look and feel of your nails. While you’ll need apply multiple times throughout the day, the fragrance and soft feel of the cream is worth the hassle of putting on the cream morning and night. You can apply this cream as soon as you wake up and at the end of your day to get tough-as-nails results. In addition, it comes highly rated from users who have brittle nails and want a natural solution. 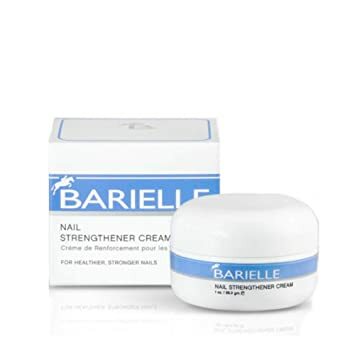 The Barielle cream strengthener is a great purchase if you want something that will change your nail texture naturally without having to apply any polish or gloss. This is a long-term solution that may take some time to see gradual results. Hard As Hoof Nail Strengthening Cream is an old standby that has been around for over 25 years. It’s one of the go-to brands for those who are looking to improve their nails naturally with a cream solution. 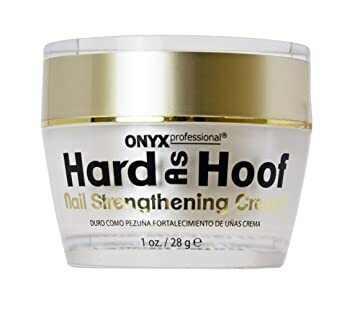 Hard As Hoof ensures that you’ll see nail growth, conditioning for your cuticle, and a number of other benefits. From our test, we found that this nail strengthener goes on smooth and soothes any breaks around your cuticle while also having a fragrant coconut finish. The formula has been shown to improve nail strength. Soft and fragile nails become hard and shiny nails in a few weeks, according to the package. Customers love this brand and have great things to say about the results, including that it works to condition your cuticles as well as your nails. Calcium, vitamin E, and hydrogenated jojoba oil are a few of the secrets found in this 1 oz package. While you may be looking for something that instantly provides shine, you should get yourself a bottle of this cream solution to naturally strengthen your nails over time so you won’t need to apply so much brightener and gloss next time. This is a natural solution that comes highly recommended and will also heal your cuticles as well. Prolana has one of the most highly-rated nail strengtheners on the market. It’s a one-step nail hardener and shiny coat treatment all-in-one. Professionals love to use Prolana because it’s easy to apply and comes with natural ingredients, so you don’t have to worry about the fumes or damaging your nail’s long-term growth. In addition to a formaldehyde-free formula, Prolana also doesn’t have any toluene or DBP, two other harmful chemicals that you may see in certain brighteners and nail polishes. In just a couple uses, you should find that your nails are thicker and resistant to peeling. You can use this as your base coat to keep your nails strength as you paint on your polish. None! This one seems perfect for everyone! Prolana has always been a top brand for nail products. They hit a home run with this nail strengthener that almost as a perfect five-star rating. You’ll be able to use this nail strengthener as a base coat and start seeing instant shine on your nails. You can use twice daily to ensure that your nails start growing faster. With a unique strengthening formula that doesn’t use formaldehyde, there are only a few products left that will get the job done right without being too smelly or not providing the right texture. We go over some of the things that you should look for when you’re shopping for a nail strengthener solution. This is by far the most important aspect of shopping for different nail strengtheners. The formula should be designed to treat your nail conditions, but you also want to be on the lookout for any type of chemicals that could be included in the ingredients. Some ingredients to look for include Vitamin E, aloe vera, coconut oil, jojoba oil, and proteins. You should steer clear of any formulas that contain formaldehyde. You’ll see that there is a slight difference in thinking behind strengthening your nails according to those who like nail polish and to those who also want to improve cuticle strength. There are two types of nail strengtheners to look for, including hardeners and hydrators. The hydrators are typically creams that provide a lot of moisturizer to the top layer of your skin and nail. While these don’t provide instant shine, they help to improve the health of your nail over time. You shouldn’t have to spend any more than $10 on a good nail strengthener. However, you’ll see some high-priced ones out there. The best deals will be online where you can find and compare a ton of different nail hardener and optimizer products. You can also look at salons to see what kinds of nail strengtheners they use and pick one for your nail condition. You should always pick a product that has clear packaging and instructions. You want something that’s going to have the right consistency and results for your nail condition as well. If you have dry or breaking cuticles, then you definitely should go with a hydrator. Otherwise, you may look at hardeners to get the best options for your brittle nails. There are some tips to keep in mind when you are looking at your nails and trying to determine what issues you want to solve first. It’s best when a nail strengthener can heal, hydrate, and harden all at once. What’s causing your weak, brittle nails? You should determine if it’s a medical condition which may not improve with the use of creams and hardeners. Strong nail hardeners shouldn’t be used more than twice per week. However, creams can be used daily. If you feel a burning sensation when you apply it for the first time, then you should wash it off immediately. You should use a moisturizing cream along with a hardener to improve the skin around the nails as well. Some hardeners can have bad long-term effects on your nails. This is especially true when the formula contains any type of chemicals, such as formaldehyde. Hand lotions and cuticle oils can help return the natural luster of your skin around the nail as well. While nail strengtheners have been around forever, there are a number of different products that may seem like they have the best features and results. You should only pick a product that has been reviewed and tested, so you know what you’re getting. Of the ones on this list, we still really like the Hard As Hoofs product because of its price and high rating. However, if you want a true hardener, then we would go with Prolane’s solution. Your nails need to be taken care of daily, so even though you may be a hardener, you probably still want some kind of cream to moisturize your cuticles and make sure that they stay safe from breakage.